On Saturday, my daughter Berlin and I leave for Dallas for some adventures! I've mentioned before that we'll be staying in Dallas for a week and then I will leave Berlin with her grandparents while I fly to D.C. for almost a week before I go back to pick up Berlin and head back home. It's going to be a great two weeks! Since I'm still planning on getting my collection done this month, I'm taking along some select supplies to help me accomplish my goal. First, I've torn down my paper, marked out my borders, and put the first layers of paint on each of my "planets" for this month's collection. I'll be keeping my paper in this white envelope with a piece of cardboard to avoid any bending. I received this envelope when I ordered something a few months ago and it's sturdiness kept me from throwing it away. Now I'm glad I kept it because it has become an excellent portable portfolio. This big zippered bag was somewhat of an impulse buy at Target, but I really love the look of it. It's a surprisingly large bag and it can hold everything I need. 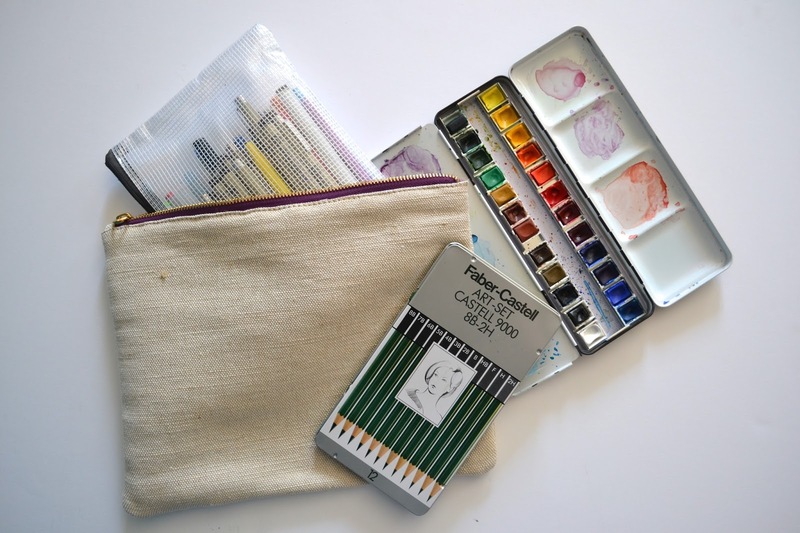 Inside I have my watercolor set, drawing pencils set, and a little bag. This little bag keeps all of the things that would be drowned in the big bag and I like that I can take it out and hold it in the palm of my hand to find whatever I need. 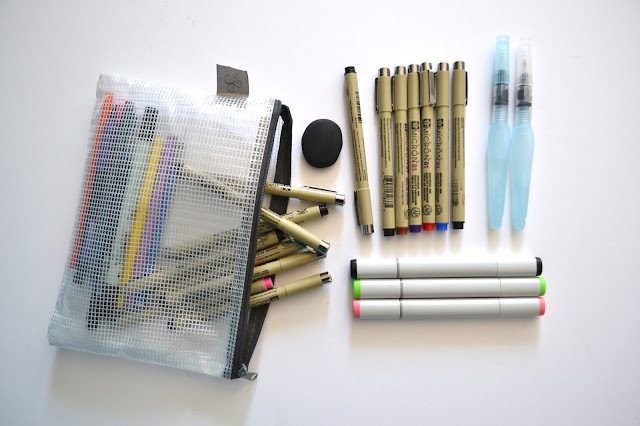 The essentials of this bag include my Micron pens, Copic markers, Aquabrushes for watercolor, and my very favorite Black Pearl eraser. 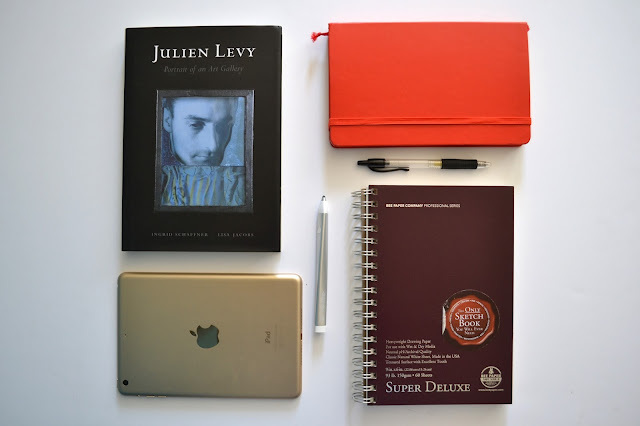 I will also be traveling with my sketchbook, a book to read (I have chosen Julien Levy: Portrait of an Art Gallery), my iPad, the Adobe Ink pen, and my trusty notebook and pen that I can't live a day without (Someday I'll do a post about my love of this red notebook!). Hopefully this sets me up for success this month! If you'd like to follow along on our travels, be sure to follow me on Instagram at @Meganat3511 !